In 1927 he saw a war film that included an impressive scene of marching troops wearing tin hats, and muddy uniforms all carrying trench equipment. Looking at the scene, it made him wonder what had becom of his comrades in the army; where they were and what they were doing. This line of thought inspired a cartoon on forgetfulness of a comradeship that had apparently ceased to exist. 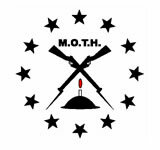 From this one idea other ideas came to the fore, then discussions with colleagues and friends and, eventually, the founding on the 07th May 1927 of an ex-serviceman’s organisation known as the Memorable Order of Tin Hats or simply MOTH. which rise above divisions of social status, race, or politics. For office details click here. The wonders of God’s handiwork in all its majesty. This is the crowning MOTH ideal, to help humanity. “For your tomorrow, we gave our today”.